David Krut Projects is pleased to present Two Social Pacifiers ጡጦ*, an exhibition by Endale Desalegn opening on Thursday 5 November at 142 Jan Smuts Avenue as part of the First Thursday’s initiative. 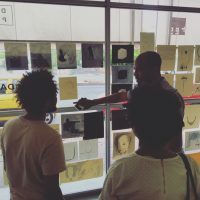 Two Social Pacifiers ጡጦ is an exhibition of prints and paintings by Ethiopian artist Endale , following the completion of his second residency at our Parkwood studio. This new body of work is a profound meditation on the ways we perceive everyday objects in light of the social structures that dictate how we relate to the world. For Endale, who was born under the Derg – a Soviet influenced communist period in recent Ethiopian history – “it is striking that the hammer and sickle universally represent communism, yet there is no one recognizable symbol for capitalism”. 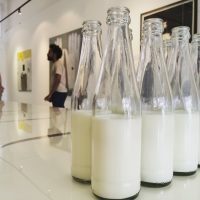 He calls on metaphorical visual tropes, such as a baby’s milk bottle and a pacifier, to draw connections between natural and constructed systems of social dependence. Where the milk bottle stands for the adult’s relationship to an ATM, the pacifier evokes methods of compensation used to sooth unfulfilled desires. Many of the works grapple with concepts of dissatisfaction and a painstaking state of waiting, explored through symbols such as a scale and tally marks, which also conjure consumerist modes of measurement and monotonous counting techniques which resonate across cultures. The impact of economic social systems on ways of seeing and feeling is explored alongside notions of the spiritual. Recurring depictions of circular stigmata applied to roughly sketched shapes suggesting hands and feet reference the multiple religious meanings associated with a circle in Ethiopian Islamic and Christian culture. 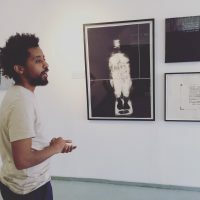 The fusion of spiritual and material concerns in Endale’s work reflects his perception that Ethiopian culture and the Ethiopian Orthodox Tewahedo Church are intricately interlinked. In contemporary consumerist times, however, we are losing this connection. For Endale, interpretation and feeling are uppermost, while form operates as a trigger for meaning. The monotype series of forks best exemplifies this relationship as a simple, universal form is used to represent states of human inequality under capitalist and communist systems. 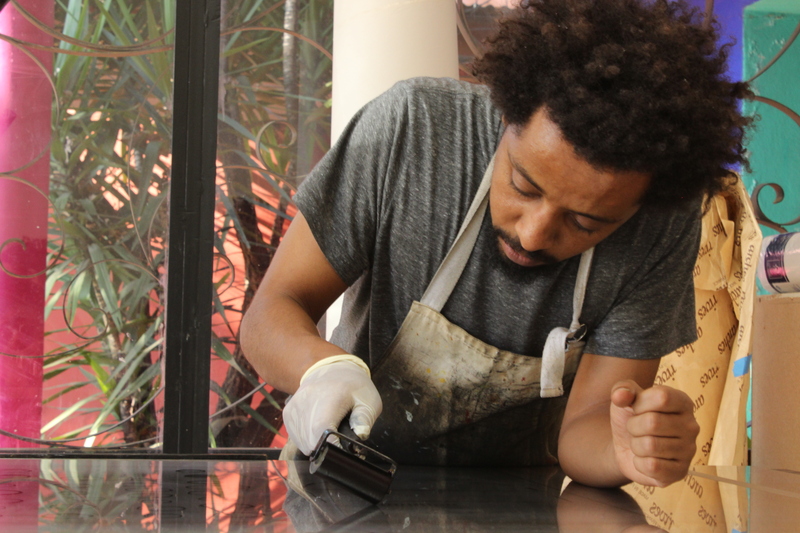 Endale studied painting at Addis Ababa University School of Fine Art and Design, graduating in 2008. 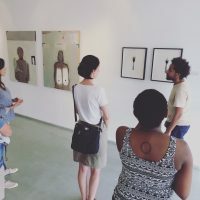 Since then, he has exhibited in solo and group exhibitions in Ethiopia, South Africa and Portugal. Previous shows, such as A Single Vibration held at David Krut Projects in 2014, have focused on the interplay between light and dark – a theme which continues to run through his work as he explores the variables that affect our perception. 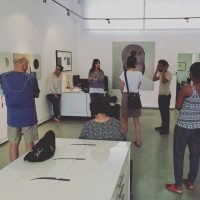 By deploying familiar but abstracted social signifiers in this current body of work, this contemplative and compelling exhibition invites the viewer to construct one’s own narrative of free association within a contemporary context where consumerism has become inextricably bound up with notions of freedom and identity. *ጡጦ – Amharic for a baby’s bottle and a pacifier, interchangeably. Pronounced “tu-to”.